London: Chelsea ended a miserable run of five straight winless games by beating Bolton 3-0 in the English Premier League on Saturday, easing some pressure on under-fire manager Andre Villas-Boas. England midfielder Frank Lampard inspired Chelsea on his recall to the team, completing the scoring with a late volley to become the first player to net at least 10 Premier League goals in nine successive seasons. Brazil center back David Luiz and Ivory Coast striker Didier Drogba earlier scored after a goalless first half, lifting the London club provisionally into fourth place. "It was important to win after all the recent disappointments," said Villas-Boas, whose job may have been untenable had Chelsea lost to a team second from bottom. "We have been trying so hard and today we managed to do a great, great game." Arsenal can regain fourth spot - the final qualifying place for the Champions League - with a win over third-place Tottenham in the north London derby on Sunday. Sixth-place Newcastle squandered a two-goal lead to draw 2-2 with Wolverhampton Wanderers, which climbed out of the relegation zone to be replaced by Queens Park Rangers, a 1-0 loser at home to Fulham. Sunderland, rejuvenated since Martin O'Neill's arrival as manager in December, was brought back down to earth with a 4-0 loss at West Bromwich Albion and last-place Wigan drew 0-0 at home to Aston Villa. Lampard was one of the leading Chelsea players, along with fellow senior stars Ashley Cole and Michael Essien, controversially left out by Villas-Boas for the 3-1 loss at Napoli in the last 16 of the Champions League on Wednesday. That defeat piled more pressure on the inexperienced Portuguese coach but he brought the old guard back into the starting lineup against Bolton and that decision eventually paid dividends. After an uninspiring first half, Luiz - often criticized for his defending - showed his nimbleness further up the field by first embarking on a dribble and then pouncing on a loose ball to curl home a fine finish in the 48th minute. The goal was greeted with a fist-pump by Villas-Boas, who sprang out of the dugout in celebration, and there were further cheers when Lampard floated over a corner that Drogba headed home unmarked from eight yards out to move within one goal of 100 in the Premier League. Lampard then grabbed his 150th career league goal by meeting Juan Mata's deep cross with a textbook volley to add to Bolton's miserable afternoon at Stamford Bridge. "It takes a bit of weight off our shoulders to get back to winning ways," said Chelsea defender Gary Cahill, who kept a clean sheet against the club that sold him in January. "The mood in the dressing room is fantastic and we will build from here." Terry Connor's first match in temporary charge of Wolves started disastrously with Papiss Demba Cisse and Jonas Gutierrez putting Newcastle 2-0 ahead after 18 minutes. However, Matt Jarvis reduced Wolves' deficit at the start of the second half and Kevin Doyle snatched the equalizer in the 66th, denting Newcastle's top-four hopes. "All credit to the lads. They came out second half, did the same things and got their reward in the end," said Connor, who will be in charge until the end of the season. Pavel Pogrebnyak's early winner for Fulham dropped QPR back into the bottom three, with the hosts' hopes of a comeback further dashed by the sending-off of midfielder Samba Diakite in the 33rd for two yellow cards. Peter Odemwingie scored twice and James Morrison and Keith Andrews added the others for West Brom in their thrashing of Sunderland, building on their 5-1 rout of Wolves a fortnight ago. 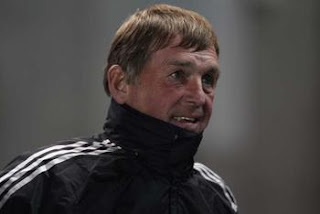 London: Victory for Liverpool in Sunday's League Cup final against second tier Cardiff City could help turn a difficult season into a success story, manager Kenny Dalglish said on Friday. The Merseyside club started the campaign brimful of optimism, having invested heavily in a squad overhaul. That early-season confidence has diminished, however, as seventh-placed Liverpool's form has become marked by a failure to turn on-pitch dominance into the hard currency of Premier League points. One bright spot for disappointed fans over an indifferent few months has been the team's cup form. After ousting rivals Manchester United they are in the quarter-finals of the FA Cup, while dogged victories over Chelsea and Manchester City helped them to reach Sunday's League Cup final at Wembley. "We have still got a huge opportunity in front of us to make the season relatively successful," Dalglish told the club's website. "We've got the League Cup final, the sixth round of the FA Cup at home to Stoke City (next month) and some really important league matches coming up. It could be a decent season for everybody." Sunday's match will be Liverpool's first appearance at the new Wembley Stadium since it reopened in 2007 and offers the club a chance to end a barren spell of six trophy-less years. For Dalglish the side are a work in progress and a long way short of the Liverpool team he played in when he first arrived at Anfield in 1977. "When I came to the club as a player I may have been the only one who came in that year," he said. "I was walking straight into a really successful club who had won the league, been to the FA Cup final and won the European Cup. Everything was set, everything was there. It was still a work in progress but where they were coming from was a really high standard." "We weren't at that standard when I came back as manager (last year). We have to try and get there." Cardiff are back at Wembley for the fourth time in four years, a run which includes a 1-0 defeat to Portsmouth in the 2008 FA Cup final. They are fifth in the second tier but manager Malky Mackay is hoping to cause an upset. "We are massive underdogs and nine times out of 10 the underdogs are beaten, but there is the other time as well," he said. "The players I have are committed, determined and lack ego. They work hard and their focus is the next game. I would stand shoulder to shoulder with any of my squad every day. They go out to win every game," said Mackay. Manchester: Manchester United went through to the last-16 of the Europa League on Thursday despite losing their first ever home game in the competition 2-1 to Ajax. Javier Hernandez stretched United's 2-0 first-leg advantage in the sixth minute before Aras Ozbiliz made it 1-1 with a well-taken half-volley on the night 31 minutes later. Toby Alderweireld scored with three minutes left but Ajax could do no more than scare United, who are in the second-tier tournament after they were eliminated from the Champions League group stages. The English powerhouses progressed to the next round 3-2 on aggregate. United will next face Atletic Bilbao in the round-of-16 after the Spanish side beat Lokomotiv Moscow 1-0 to advance on away goals. Valencia and Atletico Madrid also progressed, as did PSV Eindhoven and Udinese. United started strongly at Old Trafford against Ajax and Hernandez scored following good approach work from Park Ji-sung and Dimitar Berbatov. Ozbiliz hit a 20-yard shot past goalkeeper David de Gea for 1-1 and, after De Gea made a point-blank stop from Christian Eriksen's header, Alderweireld bundled the ball into the net from close range. One more goal would have taken the Dutch side through to the round-of-16 on away goals but United held out. Manager Alex Ferguson blamed United's problems on his selection of a defence composed of Phil Jones, Chris Smalling and the Da Silva twins. None are vastly experienced. "Tonight I used too many young players in the back-four positions," Ferguson said. "It was a big risk we took." Ferguson made four changes from the side that won in Amsterdam a week ago, with Rafael da Silva and Smalling coming in for Jonny Evans and Rio Ferdinand, while in midfield, Park Ji-Sung replaced Michael Carrick in the centre. Up front, Dimitar Berbatov replaced the ill Wayne Rooney as the Bulgarian started alongside Hernandez, with Danny Welbeck providing cover from the bench. The visitors played a very similar team to the one that lost last week. Ricardo van Rhijn came into the side for Ismael Aissatti, while Nicolas Lodeiro started as part of the front three with Dmitry Bulykin missing out through injury. The match was extremely even, with Ajax often having long periods of pressure and possession, but it was the hosts who took the lead after an energetic start from both sides, with Hernandez producing a calm finish. Berbatov slipped through an impressive forward pass which Hernandez controlled, before skipping past the attentions of Toby Alderweireld and finding the back of the net with confidence. But that was as good as it was to get for the hosts. The two sides continued to knock the ball around comfortably, but every time United advanced they looked like scoring, and Hernandez very nearly returned the favour to Berbatov with 13 minutes played. Fabio da Silva surged forward through the middle before playing an excellent pass through to Hernandez, but after being pushed out wider than he would have liked, he slid the ball towards the far post with his strike-partner arriving late, but Jan Vertonghen stretched and conceded a corner. However, Ajax were proving they weren't just there to make up the numbers as they looked to grab a lifeline. Ozbiliz acquired possession in the United area after good work from van Rhijn and tricked his way past two defenders before shooting, but David De Gea was equal to the Armenian’s effort. By now United were showcasing some increasingly sloppy passing, inviting pressure on to them, with the likes of Christian Eriksen, Lodeiro and Ozbiliz looking very dangerous for the visitors. Following a period of Ajax pressure, the hosts went close to doubling their lead on the night. Nani played a clever disguised pass down the left channel into the penalty area for Berbatov, but the striker's pass into the goalmouth was deflected ever so slightly out of the path of Hernandez, and Ajax soon made them pay. The United defence failed to clear their lines properly after breaking down an attack and the ball fell kindly to Ozbiliz on the edge of the area, with the right-winger lashing a low, left-footed half-volley into De Gea's bottom right corner. Although Ferguson's team ended the half with some considerable dominance over their visitors, Ajax held on to the 1-1 score at half-time after a battling 45 minutes. The start of the second period followed a similar pattern to the first, with both sides committing plenty of players forward, but it was Ajax who continued to look the more dangerous. First, Lodeiro went close, blasting an effort over from the centre of the penalty area following a cut-back from Christian Eriksen, then moments later Siem De Jong’s header from a corner was denied by a brilliant save from De Gea. Without creating an awful lot, Ajax continued to see more of the possession, troubling United with their quick passing and impressive movement, but two substitutions from Ferguson saw the hosts calm the contest down a little. Jonny Evans took to the field in place of Tom Cleverley, while Paul Scholes replaced Ashley Young, and the midfielder’s impact was immediate as he spread the ball around as well as ever. Minutes later, Nani was inches from getting his name on the scoresheet as the Portuguese winger cut inside from the right and let rip a thunderous effort with his left-foot, but the shot crashed off the crossbar and went behind. With just over quarter-of-an-hour to go, the hosts had another chance to put the tie beyond all doubt. 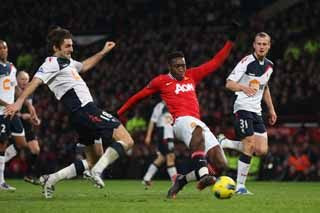 Danny Welbeck, who replaced Berbatov, stormed down the left after a clever inter-change with Park, but when he approached the goal, his attempted pass into the danger-area was intercepted and United had to settle for a corner. The visitors ensured the final moments would be nervy for United with Alderweireld finding the net following a free-kick conceded by Scholes, but they held on to progress, despite making the match a lot harder than they should have. In other matches, trailing 2-1 from the first leg, Atletic Bilbao were reduced to 10 men against Lokomotiv Moscow when Fernando Amorebieta was sent off in the 60th for a second booking. But two minutes later, Fernando Llorente flicked a corner kick towards the far post where Iker Munian hit an unstoppable volley into the roof of goal. Valencia beat Stoke 1-0 for the second time in eight days to advance 2-0 on aggregate. Pablo Hernandez lost his marker and cut along the goal-line before slipping a pass to Jonas in the box, where the Brazilian forward tapped into an unguarded net for a 24th-minute winner. Diego Godin scored in the 48th to wrap up a comfortable 4-1 aggregate win for Atletico Madrid over Lazio, heading in unmarked from a corner kick. Atletico coach Diego Simeone remains unbeaten in nine games since taking charge of the Spanish club at the start of the year, while Lazio have lost three straight to further pressure manager Edy Reja. Udinese continued Italy's interest in style with a 3-0 win at PAOK Thessaloniki that ended the Greek side's 11-match unbeaten run in Europe and clinched progress by the same score. "My players did a terrific job," Udinese coach Francesco Guidolin said. "They showed a lot of character and exceeded my expectations. I couldn't have played in this stadium, under this pressure." Hannover won 1-0 at FC Brugge to advance 3-1, PSV eased past Trabzonspor 4-1 and 6-2 on aggregate, FC Twente advanced 2-0 after a 1-0 win over Steaua Bucharest, and AZ Alkmaar went through 2-0 after a 1-0 win at Anderlecht. Sporting Lisbon beat Legia Warsaw 1-0 to advance 3-2 on aggregate, while fellow Portuguese club Braga were eliminated 2-1 with a 1-0 defeat at Besiktas. Metalist Kharkiv, Standard Liege and Olympiakos also advanced. Manchester City progressed earlier on Wednesday with a 4-0 win over defending champions FC Porto. London: Rafael Benitez's agent has denied receiving an approach from Chelsea about replacing under-pressure manager Andre Villas-Boas. The former Liverpool boss has reportedly been targeted by the struggling west London outfit, who sit fifth in the Premier League and are on the brink of Champions League elimination. However, the 51-year-old manager's representative, Manuel Garcia Quilon, has moved quickly to deny such claims. "There is nothing official," told reporters. According to The Times, Benitez had received an approach from Chelsea amid concerns over dressing room unrest at the club, with many senior players thought to be questioning Villas-Boas's authority. The former Porto boss admitted that senior squad members Frank Lampard and Ashley Cole were disappointed not to be included in Chelsea's starting XI against Napoli in the Champions League on Tuesday. Abramovich's advisors have reportedly indicated to the tycoon that the damage done to Villas-Boas' authority among the players is irreversible. 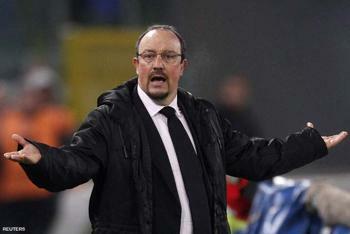 Benitez has been out of work since leaving Inter Milan after a brief spell at San Siro ended in December 2010. 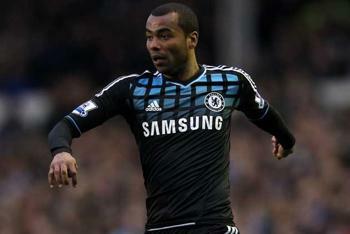 London: 31-year-old England international Ashley Cole is prepared to leave Chelsea in the summer according the The Sun. It is reported that owner Roman Abramovich has grown tired of players, including Cole, criticising under-fire boss Andre Villas-Boas and is considering a clear-out. The Russian billionaire is "fed up with their [the players] moaning," and is willing to let them leave in order to prevent a dressing-room revolt according to sources. Cole had allegedly questioned Villas-Boas' tactics after a string of poor results including Tuesday's 3-1 Champions League defeat to Napoli. The Stepney-born defender, who moved across London from Arsenal in 2006, has played over 150 games for Chelsea and is currently one of the longest-serving players at the club. The Blues currently lie in fifth place, just outside a European spot, despite Premier League title ambitions at the start of the season. Manchester: Manchester City eased past defending Europa League champion FC Porto on Wednesday, beating the Portuguese side 4-0 to wrap up a 6-1 aggregate win. Sergio Aguero opened the scoring after just 19 seconds to stretch City's 2-1 first-leg advantage but the English Premier League leaders then had to wait until the 76th minute for their second goal. Edin Dzeko, David Silva and David Pizarro completed the rout with goals in the last 14 minutes. Entered into the second-tier Europa League following their elimination from the elite Champions League, City advance to the round of 16 for a match against Legia Warsaw or Sporting Lisbon. Sporting host Legia on Thursday with the teams tied 2-2 from their first-leg match. Aguero opened the scoring after a through-ball from Yaya Toure, slipping a shot low past goalkeeper Helton. Substitute Dzeko had been on the field just seven minutes when he collected a precise pass from Aguero and shot past Helton. Porto were reduced to 10 men when Rolando was sent off for a second yellow card as City celebrated and Silva added a third goal in the 84th after good approach work from Pizarro and Dzeko. Dzeko then set up Pizarro two minutes later for his first goal for City. The buildup to the match had been overshadowed by Carlos Tevez's apology for his dispute with the club, which involved the Argentina forward leaving England and going on strike after refusing manager Roberto Mancini's order to warm up as a substitute in a Champions League match. "Tomorrow, I will meet Carlos and talk with him," Mancini said. Marseille: Andre Ayew headed home a corner deep into injury time Wednesday as Marseille beat Inter Milan 1-0 in the first leg of their Champions League last-16 matchup to pile even more pressure on beleaguered coach Claudio Ranieri. Inter's defeat was their sixth in seven games. The 2010 champion improved in the second half, but struggled to carve out clear chances against a well-organized Marseille team that lacked invention and a cutting edge up front. "Nothing's done yet. I'm happy and proud because the players believed in themselves until the end," Marseille coach Didier Deschamps said. "They were up against a team that has seen it all before, with players who are used to playing in quarterfinals, in semifinals, and yet they still won." Reluctant to discuss the match at length afterward, Ranieri blamed bad luck. "We played well, we had good counter attacks, we had more opportunities and they scored on their first chance," Ranieri lamented. "We did not deserve to lose." Ranieri replied with a blunt "no" when asked if he was feeling the strain, and boldly predicted his side will beat Marseille in the return leg at San Siro. "The San Siro will be full and it will be an advantage for us, we can score two goals no problem," Ranieri said. Inter, however, have not kept a clean sheet for nine straight games. "We have a small advantage. It will be tough over there," Deschamps said. "We can't just content ourselves with defending." The return leg is at Inter on March 13, and Ranieri must motivate his team to turn around a difficult situation amid what is likely to be more harsh criticism of his tactical choices. Milito, who is by a long way Inter's top scorer with 12 league goals, is the only player to have scored for the struggling club in its miserable seven-game spell. Ranieri said Milito has been suffering from the 'flu — but Ranieri didn't bring striker Giampaolo Pazzini on either. Ayew's superb fitness allowed him to keep making runs as Inter's aging defense tired, and the Ghana winger connected perfectly with Mathieu Valbuena's corner from the left to stun Inter's travelling support at Stade Velodrome. "Ayew has that desire, that rage deep inside of him, and he always will have it," said Deschamps, who played alongside Ayew's father, Abedi Pele, when Marseille won the Champions League in 1993. "His will to win rubs off on others. It's good for him, it's good for the team." Marseille were without top scorer Loic Remy with a thigh injury, but midfielder Alou Diarra started after shaking off a toe problem. Brazilian Brandao took up a lone striker's role with Valbuena behind him. Ranieri gave Forlan his European debut for the club — the Uruguay striker was ineligible for the group stage — and he was supported by Wesley Sneijder in a revamped attack. Marseille attacked aggressively from the outset, keen to test a defense that had leaked 15 goals in the last six games. Despite Marseille's bright start, Inter almost scored in the 11th minute when Forlan forced Mandanda into an excellent reflex save after running onto Esteban Cambiasso's pinpoint cross from the left. Marseille remained in control, however. Valbuena often dropped deep or shuffled wide to support wingers Ayew and Morgan Amalfitano, making it increasingly hard for Inter's defense to predict his runs. Marseille should have scored in the 30th. Center half Nicolas N'Koulou ran onto Valbuena's curling freekick and clipped the ball straight onto the leg of teammate Souleymane Diawara, rather than toward goal. Inter almost punished Marseille moments later, when Cambiasso pulled the ball back to the unmarked Zarate, but his shot was comfortably smothered by Mandanda. Marseille right back Cesar Azpilicueta tested Cesar with a dipping shot from 15 yards early in the second half, but Inter pushed up more and Marseille had to launch attacks from deep. Ranieri replaced Zarate with Joel Obi midway through the second half, even though Zarate was lively throughout, and the play became more scrappy, with players from both teams overlooking simple passes and trying to make the difference themselves. Stankovic then scuffed a weak shot straight at Mandanda from close range, and Ayew went close with two glancing headers before his decisive third attempt. London: Chelsea playmaker Juan Mata has suffered a suspected broken finger in the Champions League defeat to Napoli, adding further woes to the west London side. The Spaniard collided with defender Salavtore Aronica in the build-up to the game's opening goal and is now a doubt for Saturday's visit of Bolton. Boss Andre Villas-Boas has already had captain John Terry ruled out for up to two months with a knee injury, so the news of the influential midfielder’s possible absence will be a bitter pill to swallow. Mata told reporters regarding his finger: "We have to check it. Maybe it is broken." The defeat in Naples leaves Chelsea's Champions League dream hanging by a thread. Although, with the Blues having secured a potentially crucial away goal, two goals could see Villas-Boas’ men through to the quarter-finals and Mata is confident his side can pull off the comeback. "I have confidence in this team, we are not dead. It will not be easy for us but I think we can do it," he told Sky Sports. 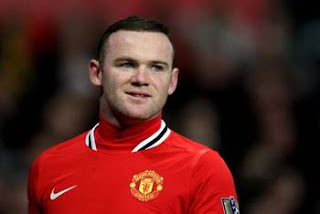 Manchester: Manchester United striker Wayne Rooney will miss Thursday's Europa League match against Ajax with a throat infection. The Red Devils secured a 2-0 win against the Dutch outfit at the Amsterdam ArenA last week, a game in which the 26-year-old played the full 90 minutes. Sir Alex Ferguson is hopeful that the England star will recover in time to feature at Carrow Road on Sunday for his side's trip to Norwich City. "Rooney's out for Thursday. He has a bad throat," the Scot told reporters. "There were traces of it in Amsterdam last Thursday and he's been in bed for a lot of the weekend." Rooney had picked up an assist for Javier Hernandez's second goal in the first leg of the club's round-of-32 clash. Milan: Struggling Bologna beat 10-man Fiorentina 2-0 on Tuesday to boost their chances of Serie A survival. Bologna were clinical in the first half, with Alessandro Diamanti and Gaston Ramirez scoring to establish a solid half-time lead. Fiorentina had several opportunities but a combination of wasteful finishing and strong goalkeeping by Bologna's Jean-Francois Gillet kept them from scoring. Any hopes they had of getting back in the game all but evaporated five minutes into the second half as Ruben Olivera was sent off for a serious foul on Diamanti. Bologna are now level with 12th-placed Fiorentina and seven points above the relegation zone. Fiorentina started brightly and could have taken the lead in the opening five minutes when Stevan Jovetic hit a hard right-footed shot that skimmed past the right post. Jovetic threaded a promising ball into the area in the 22nd minute for Amauri and although the Brazilian beat the offside trap, Gillet rushed out in the nick of time to smother the danger. The duo combined again a few minutes later but Gillet again denied Amauri his first league goal for Fiorentina. Bologna took the lead on the half-hour mark. Marco Di Vaio crossed for Diamanti and although Fiorentina goalkeeper Artur Boruc kept out his initial effort, he could do stop the follow up. Fiorentina searched for an equalizer and Gillet again did well to deny Amauri and Riccardo Montolivo. Bologna extended their advantage on the stroke of half-time when Ramirez backheeled in Di Vaio's pass. Fiorentina were reduced to 10 men shortly after the break when Olivera was shown a straight red for a brutal challenge on Diamanti. The visitors could not find a way back into the match and almost found themselves further behind when Panagiotis Kone's header flashed wide. London: Carlos Tevez finally apologized to Manchester City on Tuesday following a five-month feud that has cost him close to 10 million Pounds, and could soon return to action for the club after withdrawing an appeal against his latest fines. The Argentina striker has not played for the Premier League leaders since September when he refused to warm up during a Champions League match and only returned last week from a three-month unauthorized absence at home. 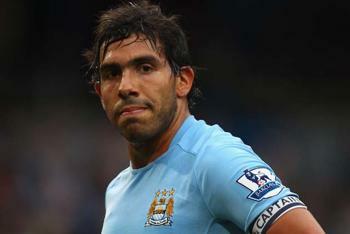 City coach Roberto Mancini had initially told Tevez he would never play for City again after his act of public insubordination, but later softened his stance and only asked for an apology. That came on Tuesday, with City announcing that Tevez has "apologized to all concerned for his recent conduct." "I wish to apologize sincerely and unreservedly to everybody I have let down and to whom my actions over the last few months have caused offence," Tevez added in the same statement. "My wish is to concentrate on playing football for Manchester City Football Club." Tevez's relations with City broke down during last season after the striker said he wanted to leave England to be closer to his family, which moved back to Argentina after failing to settle in Manchester. However, the club refused the then-captain's transfer request, and Tevez went on to help City end a 35-year trophy drought with a victory in the FA Cup final. 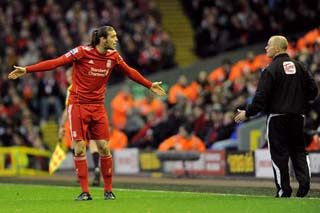 But he then enraged Mancini with his act of rebellion at Bayern Munich in September. The dispute has cost Tevez around 10 million Pounds in fines or lost earnings, including a multi-million-Pound bonus he missed out on by handing in the transfer request. He had been challenging the most recent fine of around 1.2 million Pounds, but will now accept the punishment. "Carlos has ... withdrawn his appeal against the club's finding of gross misconduct which was due to be heard by a Premier League panel in the coming days," City said. "He has since begun a training programme designed to return him to optimum fitness." Tevez had hoped to join AC Milan in the January transfer window but a deal broke down. After the Munich incident, Tevez was suspended by City for two weeks and fined a fortnight's wages for refusing to resume warming up during the match. An internal disciplinary hearing found Tevez guilty of five breaches of contract, including bringing the club into disrepute and failing to follow the instructions of his manager. Returning to Argentina in the wake of those sanctions - without permission - seemed to have ended any hope of the striker playing for City again, but he could now return to action when he is fit. City have not struggled without him, with the team on course to win the English championship for the first time since 1968 as they sit top of the standings. Naples: Chelsea's troubles worsened after sloppy defending led to a 3-1 loss at Napoli in the last-16 of the Champions League on Tuesday, with Ezequiel Lavezzi and Edinson Cavani again dampening English hopes in an entertaining first leg. Cavani, who struck a brace against Manchester City to eliminate the Premier League leaders in the group stages, was again in inspirational form as he raced past a ball-watching Branislav Ivanovic and gave Napoli the lead at half-time, before setting up Lavezzi's second in the 65th minute. Lavezzi had earlier scored with a curling shot to equalize after Juan Mata gave Chelsea a surprise lead following a mistake by Napoli captain Paolo Cannavaro. This was Chelsea's fifth match without a win and means there is likely to be no English team in the quarter-finals after Arsenal lost 4-0 at AC Milan last week. Only three teams have come back from two goals down in a second leg. 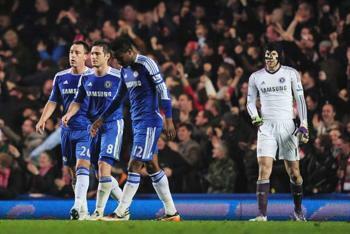 "I want to be the fourth," Chelsea coach Andre Villas-Boas said. "We're sure we can turn it around at the Bridge because of the chances we had tonight. Being clinical in front of the goal was the difference between the two teams. Napoli were efficient in front of goal and we weren't. We made a couple of mistakes and Napoli took advantage of those opportunities." Chelsea, who have slipped to fifth in the Premier League, were without captain John Terry, and the club announced before kick-off that the defender needs knee surgery and will be out for up to six weeks. Terry's absence told as Napoli breached the Chelsea defence time and time again. "We have to focus on reorganizing the relationship between the back four," Villas-Boas said. "We have to solve these issues at the back so we can profit more from the opportunities we have. ... The first two goals we had more numbers back, and if we were more organized, they wouldn't have scored." It could have been even worse for Chelsea as Napoli wasted several opportunities to extend their advantage, most notably when Ashley Cole cleared Christian Maggio's close-range shot off the line. "It is a pity that we didn't get the fourth, with Maggio's chance," Napoli coach Walter Mazzarri said. "That would have helped us and we would have been more calm going to London. Chelsea were strong, as we knew they'd be. We were great, especially up front and in reacting to Chelsea going ahead. We had a difficult 15 minutes but then we equalized and grew from there." "Napoli had great chances tonight but it won't be easy in London. Chelsea are capable of scoring two goals at home so we have to take our opportunities. There's the great disappointment not to have scored a fourth, we had so many chances to and we deserved to." Napoli got off to a bright start and could have taken an early lead but Lavezzi miscontrolled a good through ball from Gokhan Inler and Petr Cech gathered the danger. Having started the game ahead of Cole due to the England man’s fitness concerns, Bosingwa was forced off with an apparent hamstring injury just over 10 minutes into the proceedings, prompting the first-choice left-back’s introduction. As Napoli pressed, a mistake allowed Florent Malouda to rob the ball and race toward goal, but Cannavaro made a perfectly timed tackle just as the Chelsea striker was about to shoot. The home side almost went in front in the ninth minute when Marek Hamsik picked out a completely unmarked Cavani on the left of the area. Cavani has scored three goals in his last two Serie A games to take his tally to 15, but the Uruguayan was denied by a great leg save from Cech. Napoli were looking more and more dangerous and seemed certain to take the lead but Chelsea gave an early warning that they were not to be ignored when a long throw from Cech to Malouda caught the Napoli defence napping and goalkeeper Morgan De Sanctis did well to clear. However, it was mainly one-way traffic and Christian Maggio saw a fierce cross-goal shot kept out by another impressive Cech dive. Chelsea stunned the Stadio San Paolo crowd in the 27th minute when Cannavaro gifted the visitors the lead by diverting a cross straight into Mata's path. After being picked out by Didier Drogba, Daniel Sturridge's resulting cross was inexplicably mis-kicked by the Napoli captain back toward his own goal. The ball fell perfectly for Mata, and the Spaniard calmly slotted the ball into the left corner. The Premier League side almost doubled their lead but David Luiz headed Mata's corner narrowly over. Napoli drew level in the 38th when Lavezzi collected the ball on the edge of the area, eluded Chelsea midfielder Raul Meireles, before curling it into the bottom right corner past Cech's outstretched hand. Ramires had a great chance to restore Chelsea's advantage moments later but he blazed his effort well over. Chelsea were to regret that missed opportunity as Cavani put Napoli in front on the stroke of half-time, bundling home Inler's cross from almost on the goalline for his fifth goal in seven Champions League appearances this season. The visitors almost drew level immediately after the break but Hamsik cleared off the line following a scramble in the Napoli area. Napoli should have extended their advantage when the ever-dangerous Cavani raced down the right flank before releasing Walter Gargano for what looked to be a certain third goal but, one on one with the goalkeeper, he fired narrowly wide of the right upright. Chelsea improved as the match went on and came close to the equalizer on several occasions, notably when Didier Drogba muscled his way through on goal but Salvatore Aronica and De Sanctis combined to clear the danger as the Ivory Coast international bore ominously close to goal. Instead, Napoli extended their advantage five minutes later. After Chelsea defender David Luiz gave the ball away sloppily, Cavani turned his marker well and passed across the outside of the area, past an outrushing Cech, for Lavezzi to slot into an empty net. "We always say we keep working hard on the training ground but unfortunately we don't seem to transport that on the pitch," Cech said. "We have quality players who can turn it around, but it could be better because we don't have time to recover. We have a lot of games coming up and we are not in a position to drop many points in league." "It's not an ideal situation but we are still in the Champions League and we will fight to the end." Villas-Boas looked to wrestle back control by summoning Lampard and Michael Essien from the bench, but chances dried up at both ends for a period as Chelsea were visibly affected by conceding the third. Napoli almost scored again as Cech flapped at a cross but, with the goal gaping, Cavani slipped and Maggio then saw his effort cleared off the line by Ashley Cole. Chelsea laboured late in search of another away goal, Lampard hitting a testing long shot into De Sanctis' arms in stoppage time, but it ended with Napoli in control of the tie. Manchester: Manchester City manager Roberto Mancini believes that Chelsea are "in trouble" and that they could face problems in their Champions League clash with Napoli. Mancini, who saw his own team knocked out in the group stages of Europe's elite competition, believes that the Stamford Bridge club could be there for the taking ahead of Tuesday's last 16 clash at San Paolo. The Blues have gone four games without a win, including Saturday's home draw with Birmingham in the FA Cup, and Mancini is adamant that Chelsea "have problems". He told Il Mattino: "They have problems, have not won a game for some time and it is clear that they are in trouble. But I would not put too much trust [in their supposed crisis]. "It is true that Napoli are a side who are able to score anywhere, but to go to London with Chelsea obliged to overturn the result of the first leg would give [coach Walter] Mazzarri's team a great advantage. "At Stamford Bridge, Napoli would be lethal on the counter-attack." Barcelona: Barcelona forward Lionel Messi has revealed that he and his colleagues have made it clear to coach Pep Guardiola that they want him to sign a new deal with the club. Guardiola's current contract expires at the end of the season and the former Spain international has yet to give any indication as to whether he will sign an extension. Messi, though, remains optimistic that the Barcelona boss will soon commit his future to the club as he retains the full support of the Catalans' squad. "He knows what we think and he will make the decision when he sees fit," the Argentina international was quoted as saying by AS. "We want him to continue. He means a lot to us and to this club." Meanwhile, after scoring four goals in a stunning 5-1 victory over third-placed Valencia on Sunday evening, in what was his 200th La Liga appearance for Barca, Messi resisted the opportunity to bite back at those who have questioned his form of late. "There is always a time of year, it is said [that he's playing poorly]," he reasoned. "[But] I have the confidence of my colleagues, of the coach and people of Barcelona - and that is what matters to me and makes me feel happy." 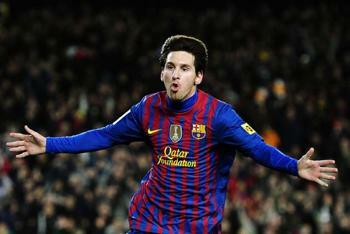 Messi, who made his debut for the club in October 2004, has now scored 146 La Liga goals for Barca. Meanwhile, Barcelona sporting director Andoni Zubizarreta insists that Guardiola will be given as much time as he wants to decide whether to sign a contract extension with the club. Barca supporters are becoming increasingly fearful that their beloved coach could move on at the end of the campaign, but Zubizarreta says that the Catalan club's directors are unwilling to pressure Guardiola into making a decision one way or another. 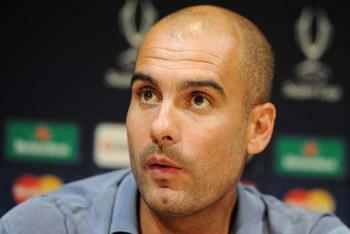 "Pep knows he has all the confidence of the club and the team," the former Barca goalkeeper told Canal Plus. "He's asked for time and that is not a problem. We have given him no deadline - and nor will we; he has our trust. If he needs time, he will be take it. Every year that he has renewed, he needed time to feel it." "He is a coach who lives better with the pressure of a one-year contract. Each has their own style. That type of contract is fine with us. The club is calm." 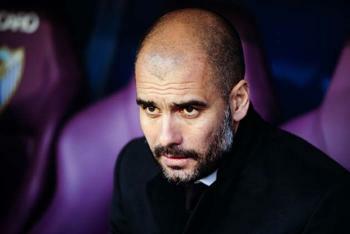 Guardiola has led Barcelona to 13 titles since succeeding Frank Rijkaard as coach in 2008. 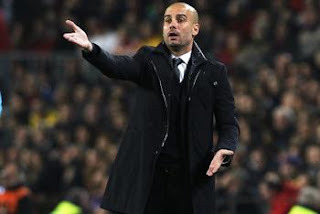 Barcelona: Barcelona coach Pep Guardiola hailed his players as a credit to the game after Sunday night's 5-1 demolition of Valencia in La Liga, and argued that his side do not deserve to be 10 points behind La Liga leaders Real Madrid at this point in the season. The Catalans, who have won 13 titles since Guardiola took charge in 2008, fell behind to an early goal from Pablo Piatti at Camp Nou but came storming back to win courtesy of four goals from Lionel Messi and one from Xavi. Guardiola insisted after the game that this current Barca squad, who travelled to Japan in December to claim the Club World Cup, had again underlined why some pundits believe them to be the best side ever assembled. "We played very well this evening," the former Spain international told reporters after the game. "We’re very happy with how things have gone and how we’ve played. We’re happy to have entertained the crowd. We’re happy that plenty of people have come to see us; let’s hope that they enjoyed it." "I always think that we’re really lucky to have this generation of players. It’s a privilege to be able to enjoy them because they’re fantastic lads." Guardiola also urged his players to fight for the league title until the end. "We’re 10 points behind but, honestly, I don’t think we deserve to be 10 points behind, the way we’ve played this season. There are many things that have happened that have resulted in us being this far behind and it will be difficult to make up those points." "But we have to try during the three months that are left to come back and we have to try to compete - like we did today." Guardiola added that he believes it is his players' drive and desire which sets them apart from the majority of their rivals. "I know that in sport you have to test yourself every day; every moment," he mused. "And I don’t think there’s a greater example of that than these players. How many teams have won things and then not been able to follow it up the following season?" Barcelona return to La Liga action against Atletico Madrid at the Vicente Calderon next weekend. Milan: Sulley Muntari scored on his AC Milan debut in a 3-1 victory at struggling Cesena on Sunday, taking his new team back to the top of Serie A.
Muntari opened the scoring in the 29th minute and Urby Emanuelson doubled Milan's lead two minutes later. Robinho added a third 10 minutes into the second half. Daniel Pudil grabbed a consolation for Cesena, who remain seven points adrift of safety after Siena lost 4-1 to Lecce in a relegation battle. Milan are a point above Juventus, who have a game in hand. The two teams meet in a mouthwatering clash next weekend. "Up until 3-0 today the boys played a great game," Milan coach Massimiliano Allegri said. "Then we gave Cesena too much initiative and we sat back too much. We didn't push forward any more. "I hope we have everyone available for Juventus but whoever plays will do well in any case. Now we have a week to prepare for that test, it will certainly be a fascinating game." Elsewhere, Roma captain Francesco Totti played his 700th game for the club to help them edge out Parma 1-0, with Fabio Borini scoring the only goal. Lazio were routed 5-1 at Palermo. Milan were in control throughout and the defending champions went in front when Thiago Silva whipped in a free kick that Francesco Antonioli failed to hold, allowing Muntari — who signed on loan from bitter rival Inter Milan last month — the easiest of tap-ins. The visitors doubled their lead two minutes later when Emanuelson dribbled toward the Cesena goal before unleashing a wicked effort that flew into the back of the net from the edge of the area. It could have been more for Milan with Maxi Lopez hitting the post, but instead Cesena almost got back into the game seconds after the break when Adrian Mutu headed over the bar from close range with only the goalkeeper to beat. Milan extended their advantage when Robinho latched onto Ignazio Abate's pass, raced into the area and slotted the ball into the far corner. Cesena scored in the 65th when Pudil drilled an effort into the bottom right corner from just outside the area. Cesena slip to the bottom of Serie A after Novara, who started the day last, drew 0-0 with Atalanta in an entertaining match full of chances for both sides. Novara midfielder Simone Pesce was sent off in stoppage time for a second yellow card. Lecce boosted their hopes of survival after coming back from a goal down. Cristiano Del Grosso put Siena in front when he lashed in Angelo's cross from six yards. However, the lead lasted just seven minutes. Gianluca Pegolo did well to parry David Di Michele's fierce strike but could do nothing to prevent Luis Muriel's effort from flying into the bottom right corner. Lecce were awarded a penalty midway through the second half after Muriel had eluded four men as he raced toward goal before he was brought down in the area by Alessandro Gazzi. Di Michele converted the penalty, drilling the ball into the bottom left corner. Juan Cuadrado sealed the result with a solo effort eight minutes from time. 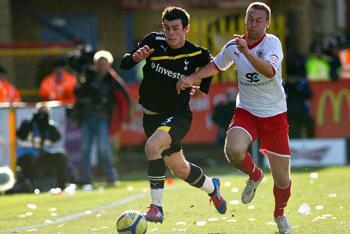 He raced more than half the length of the pitch and beat several defenders before lofting the ball over Pegolo. Davide Brivio added a fourth deep into stoppage time, curling a free kick in under the crossbar, three minutes after Manuele Blasi had been sent off for kicking out at Siena striker Mattia Destro. In Rome, Totti was presented with a special plaque before kickoff to commemorate his achievement. Fernando Gago raced down the right flank before picking out Borini, who sped into the area and fired into the far corner. Roma could have extended their lead but was hindered by a combination of poor finishing and good goalkeeping by Antonio Mirante. Lazio had snuck up to third following three victories in their past four games, and Edgar Barreto, Massimo Donati and Matias Silvestre gave Palermo a solid halftime lead. Lazio had come back from two down to win against Cesena last weekend, but there was no way back after Igor Budan and then Fabrizio Miccoli extended Palermo's advantage five minutes after the break. Lazio defender Andre Dias was sent off in the 73rd. Miroslav Klose scored for the visitors five minutes from time. Chievo Verona beat Genoa 1-0 thanks to Cyril Thereau's strike on the half-hour mark, and Udinese drew 0-0 against Cagliari. Madrid: Lionel Messi's sublime chip capped a four-goal performance as the three-time Ballon d'Or winner moved past the 40-goal mark for a third straight season in mesmerizing fashion to lead Barcelona's 5-1 thrashing of Valencia on Sunday. Barcelona had to come from behind to stay within 10 points of Real Madrid, easily answering the Spanish leader's 4-0 rout of Racing Santander one night earlier with a pure display of the football that has crowned them the world's best team. The undoubted star was Messi, who chipped goalkeeper Diego Alves after being put through by Sergio Busquets for his 27th league goal, 42nd in all competitions and 146th for Barcelona — and in his 200th appearance for the club. "The team played an incredible game. Some days you play well and some days you play poorly but what important is the team wins," said Messi, whose only other four-goal performance was against Arsenal in the Champions League nearly two years ago. Valencia had the early momentum, however, thanks to a ninth-minute goal when Sofiane Feghouli picked out Pablo Piatti's run into the area with a perfectly floated cross for the Argentine to guide the ball past goalkeeper Victor Valdes. Valdes wouldn't be called into action again until midway through the second half to deny Feghouli as the visitors played without Ever Banega, who needed surgery for a fractured left ankle earlier Sunday after his car reportedly ran over it. Messi's first goal was memorable, collecting a loose ball inside the area and dribbling near to the goal line, patiently waiting for Alves to commit before sliding it under the goalkeeper in the 22nd minute. Messi had a chance blocked in the 26th before scoring a minute later, the Argentina captain jumping on the rebound to poke the ball into the roof of the net after Alves had initially saved his first shot. Barcelona then simply overwhelmed Valencia, with Cesc Fabregas often coming close, including a spectacular 40th-minute swerving volley that struck the crossbar. Alves was Valencia's standout player, stopping at least a dozen shots, including from substitute Cristian Tello. The rebound, however, allowed Messi to power home a left-footed shot in the 76th to ensure his fifth hat trick of the season, matching Romario's feat for the club during the 1993-94 season. Messi then moved within one goal of Cristiano Ronaldo's league-leading total of 28 with his fourth. Barcelona were coming off a 3-1 win at Bayer Leverkusen in the Champions League on Tuesday and missing the suspended Daniel Alves and Javier Mascherano. But returning were Gerard Pique and Xavi Hernandez, who came off the bench to score the last in stoppage time. "How many teams have won things and then fallen apart the next season, and the next?" asked Barcelona coach Pep Guardiola, who has had to fend continuous questions over his future as he takes his time on deciding on a contract extension. "Not these players." Earlier, Athletic Bilbao scored three goals in four second-half minutes to beat Malaga 3-0 while Levante's early season success continued to unravel during a winless 2012 after a 5-3 loss to Rayo Vallecano. Malaga dominated the first half at the San Mames with 14 shots, but conceded in the 58th minute to Fernando Amorebieta before Mikel San Jose headed home a corner kick in the 60th. Gaizka Toquero completed the reversal by sliding into Ander Herrera's cross-goal pass to volley home from a tight angle. "We didn't allow any scoring chances and we created them," said Bilbao coach Marcelo Bielsa, whose decision to bring on Fernando Llorente for the second half also helped spark his attack. " We defended and attacked a little better in the second half." Espanyol, which drew 1-1 at Getafe on Saturday, and Athletic share fourth and the last Champions League qualifying spot behind Valencia, with Atletico Madrid and Levante a further point back. New Sporting Gijon coach Javier Clemente began with a 1-1 draw against Atletico, which remains unbeaten under coach Diego Simeone. Lass Bangoura and Diego Costa both scored two goals as Rayo won their third straight match to move within two points of fourth place alongside Malaga. Also on Sunday, Ikechukwu Uche scored two goals as Granada rallied to beat 10-man Real Sociedad 4-1 and Victor Casadesus' brace powered Mallorca to a 4-0 win over Villarreal. On Monday, last-place Zaragoza play Real Betis. Liverpool: Liverpool thoroughly outclassed Championship outfit Brighton 6-1 in the FA Cup on Sunday to progress to the sixth round, with three own goals from the visitors helping the hosts on their way. The home side set up another Cup tie at Anfield against fellow Premier League side Stoke City and continued on their way to a second final at Wembley. Three own goals certainly helped the score-line rise throughout the game, but it was Martin Skrtel who opened the scoring, heading in from a Steven Gerrard corner. A fabulous free kick from Kazenga LuaLua stunned the hosts before the Reds restored their lead just before the break with Liam Bridcutt helping Glen Johnson’s header on its way into the net. Another Bridcutt own goal and one from Lewis Dunk, as well as a great strike from Andy Carroll saw the tally rise to five, before a saved penalty from Luis Suarez denied Liverpool a sixth, but the Uruguayan headed in from close range to make up for his miss. It was a perfect start for the hosts, as Liverpool went ahead with the first chance of the game. 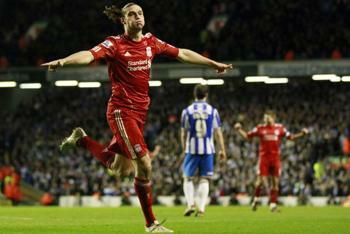 A corner was conceded by Brighton following a dangerous shot and Steven Gerrard stepped up to the set piece. The skipper sent his kick towards the front post, where Skrtel was waiting to pounce and headed in with ease. Brighton, coached by former Uruguay and Chelsea midfielder Gus Poyet, cancelled out Liverpool’s fourth-minute opener after a splendid low free kick from LuaLua. Striking from 25 yards out, the midfielder drove the ball underneath the defensive wall and Pepe Reina struggled to get to the ball as it skidded into his corner. The Reds came close to restoring their lead after Stewart Downing followed a ball into the box and struck from close range, but the winger’s goal-bound effort was cleared in a timely fashion by a well-positioned Brighton defender, who did enough to rid the danger from the line. Luis Suarez came alive halfway through the first period to test Peter Brezovan on two occasions, both forcing action out of the goalkeeper and his defence, and earned Liverpool a couple of set-pieces. As the break loomed, Liverpool began to turn the screw even further and eventually took the lead for the second time after a scrappy affair in the Brighton box. A corner arrived in the area and was poorly dealt with by the Seagulls’ defence, allowing Suarez to shoot freely, the Uruguayan’s effort bouncing off of Ashley Barnes on the line and falling to Johnson, who headed in at the back post. Brilliance from Liverpool saw the hosts produce a two-goal buffer between themselves and Brighton. Tenacious work down the left flank from Downing saw the winger get past his man and cut the ball back for the waiting Carroll on the penalty spot, the big man clipping the ball home for the hosts’ third of the evening and his eighth of the season. A defensive mix-up between defender and goalkeeper saw Brighton concede a fourth after Liverpool broke down from the centre of the park. The mistake sees the Seagulls give the ball away in their own box and the Liverpool skipper pounced on the loose ball and got to the by-line after an initial effort was blocked, but his second was kicked into the roof of the net by Bridcutt, whose game proceeded to get worse after netting his second own goal of the game. Captain Gerrard had been in the action all night and the skipper was rewarded by in effect getting Liverpool’s fifth of the evening. The midfielder, racing to a defensive mix-up, got to the loose ball to have an initial effort before trying again from the by-line, and his effort was poked into the roof of the net by Dunk. All of Liverpool’s chances looked to be producing goals and when a penalty was awarded to the home side, it looked certain that one more would be added to the tally. Substitute Dirk Kuyt was brought down by Craig Noone and Suarez stepped up to the spot, but the Uruguayan couldn’t make the effort count and after a goal-line scramble, the ball was cleared. However, lackadaisical defending by Brighton soon allowed for the next goal to come. 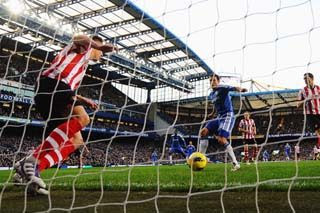 The Seagulls made a mess of a cross into the area and Suarez popped up to head a sixth for the hosts from close range. Liverpool thus warmed up for next weekend's League Cup final against Cardiff by joining Sunderland, Bolton, Everton and Leicester in the quarter-finals. Stoke, who lost 1-0 to Manchester City in last season's final, will meet Liverpool next. "It is a great achievement by the football club to have made a third successive quarter-final appearance," Stoke manager Tony Pulis said. "We're one win away from Wembley again." London: Premier League title contenders Tottenham were held to a 0-0 draw in the FA Cup by third-tier side Stevenage on Sunday, when Stoke advanced to the quarter-finals with a 2-0 win at Crawley. Spurs had a first-half goal by Louis Saha ruled out because of offside but were largely frustrated by an organized Stevenage team containing former Tottenham fringe players Chris Day and Ronnie Henry. The hosts held firm against a strong Spurs line-up to guarantee a dream fifth-round replay tie in London at White Hart Lane, and even caused several moments of concern for Harry Redknapp's side. Big chances were few and far between but Louis Saha saw his second-half strike chalked off after his effort went in off Scott Parker, who was standing in an offside position, and there were few other major talking points. The hosts named an unchanged side from the one that beat Sheffield Wednesday on Tuesday, with a fairly orthodox 4-4-2 formation being selected as Darius Charles partnered Chris Beardsley up front. Despite putting out a relatively strong team, Redknapp made six changes from the team that recorded a 5-0 win over Newcastle in their last Premier League match. Carlo Cudicini replaced Brad Friedel, Ryan Nelsen came in for Ledley King and Younes Kaboul started in place of Benoit Assou-Ekotto. Further up the pitch, Jake Livermore started in the centre of midfield with Luka Modric ruled out through illness, Niko Kranjcar dropped to the bench for Danny Rose, and Jermaine Defoe came in with Emmanuel Adebayor given a rest. It was clear from the first minute that Spurs weren’t going to be allowed to play their usual free-flowing football, with the hosts setting out to physically intimidate their Premier League superiors. Chances were few and far between in the first half-hour, with Rose's low effort past the far post the closest either side came, but the match began to liven up in the attacking third as half-time approached. Around the 30-minute mark Kyle Walker probably should have opened the scoring for the visitors as he put a header wide of the post from right under the crossbar following Rose’s good build-up play and cross from the left. Soon after, Louis Saha had a great chance as he brilliantly chested down a high-ball into the penalty area but, as he pulled his left foot back to shoot, his boot was pulled off by the studs of a close-by defender, sending his shot well over. Kaboul was the next Spurs player to go fairly close, smashing a free kick wide of the far post from the left wing. It was hit at quite ferocious pace, but whistled just past Chris Day’s left post. There was still time for Stevenage to get a late chance too, but Beardsley couldn’t quite stoop low enough to connect with Luke Freeman’s corner and the two teams went into the break level, with the visitors far from out-classing their League One opponents. After a lacklustre display in the first-half, Spurs came back out in the second period looking a little more focussed. Gareth Bale, who had previously been poor, surged through the middle and shot from just outside the penalty area, but Day expertly got down to his left, tipping the effort round the post. Nine minutes into the second-half, Spurs thought they had taken the lead as Saha found the net from yards out, but it was ruled out mid-celebration, with the linesman correctly highlighting that the ball went in off Scott Parker, who was stood in an offside position. With the hosts still level, Joe Byrom went close from range, hammering a left-footed strike just wide of the top corner, but Cudicini appeared to know it was sailing past the post. Moments later, Joel Byrom’s shooting was again causing problems, this time forcing Cudicini into a save, but the Italian made a bit of a mess of it and had to be bailed out by Ryan Nelsen. Stevenage continued to have their fair share of possession, not looking even slightly in awe of the Premier League giants, but Saha managed to get another chance with just over 15 minutes to go. Bale marched down the right wing before cutting a ball back into the area for the Frenchman, but he could only get a tentative flick away with his heel and it was easily collected by Day. After several changes from both sides, Spurs began to really press for the winner with the full-time whistle nearing, but they weren’t getting any luck in front of goal. The introduction of Aaron Lennon injected some energy and speed back into the Spurs team and he set up a good chance for Defoe on the edge of the area, but his left-footed effort went harmlessly wide. The two sides continued to press and attack as the match went on, but chances were rare and the hosts held firm to achieve the hard-fought 0-0 draw and now face a trip to White Hart Lane. Redknapp said he hoped the superior pitch at his club's White Hart Lane stadium would work in the Premier League side's favor in the replay. "The pitch was bumpy and the ball was bobbling everywhere," Redknapp said. "It was difficult to get the ball down and play on that pitch. It was very, very hard." "This wasn't a game to get the ball down and play football. We started hitting it long and it was difficult to get that much going. We are still in the Cup and are at home now. It gives us a big chance but I wouldn't underestimate them by any chance." 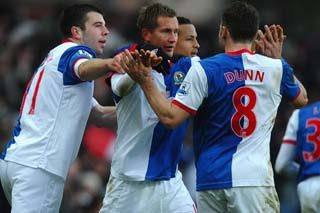 The winner of the replay will play Bolton in the next round. Meanwhile, Stoke - last season's runners-up - overcame an early red card to Rory Delap to beat fourth-tier side Crawley through a 42nd-minute penalty by Jonathan Walters and a 52nd-minute header from Peter Crouch. Stoke join Sunderland, Liverpool, Bolton, Everton and Leicester in the quarter-finals. Stoke will face Liverpool, Everton will play Sunderland, while the other March 17-18 quarter-final will be between Leicester and the winner of a replay between Chelsea and second-tier Birmingham. London: Arsene Wenger is looking for Arsenal to “show internal strength and resilience” to bounce back against Tottenham after a 2-0 defeat away to Sunderland dumped the Gunners out of the FA Cup. Following their 4-0 midweek mauling by AC Milan in the Champions League, the north Londoners had a tough time at the Stadium of Light as Kieran Richardson and an Alex Oxlade-Chamberlain own goal condemned them to elimination and the prospect of another trophyless season. “I feel we had a committed performance and we gave absolutely everything that was left in our legs. 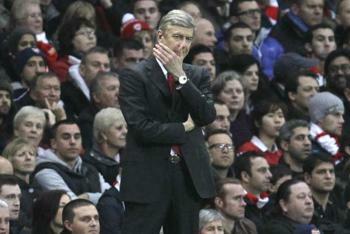 It was a very difficult game,” Wenger admitted in the post-match press conference. The Frenchman spoke scathingly of criticism that he has received from the media, when asked if the result meant that the club was in crisis. “I think it is a very harsh judgement,” he added when told of Roy Keane’s comments that the current Gunners side are "the worst Arsenal team I've seen in all my time of watching football." Francis Coquelin, Aaron Ramsey and Sebastien Squillaci were all withdrawn due to injury during the game and Wenger admitted that injuries were an increasing problem. Madrid: Angel di Maria has been left out of Real Madrid's squad for Tuesday's Champions League match at CSKA Moscow after apparently aggravating a leg muscle injury. The Argentina international made his first appearance of 2012 in Saturday's 4-0 league win over Racing Santander, and scored the Spanish leaders' third goal 10 minutes after coming on in the 63rd. But Di Maria went down awkwardly near the end of the match, appearing to injure the same right leg that had kept him sidelined since December. Madrid say Di Maria, Lassana Diarra and Hamit Altintop were not included in Sunday's 21-man squad for the first leg of the last-16 match due to injuries, while fullback Alvaro Arbeloa does return. London: Roy Keane has piled more criticism on Arsenal by claiming their current side is the worst he has seen since he started watching the club play. The Gunners followed up a 4-0 defeat to AC Milan in the Champions League on Wednesday by being knocked out of the FA Cup with a 2-0 loss away to Sunderland. The Irishman's comments came during half-time at the Stadium of Light, when Arsene Wenger's side were trailing 1-0, and he believes it is the players who are letting the manager and fans down. He told ITV: "You're on about trying to do well for your manager and once again they're letting him down. This is probably the worst Arsenal team I've seen in all my time of watching football." Keane also criticised the decision of most of the Arsenal team to wear gloves during the match. The former Manchester United and Republic of Ireland captain said: "From the first minute when you see five or six of the Arsenal players wearing gloves, you're talking about a reaction, you're sending signals to the opposition. I don't think a footballer should wear gloves when they're playing a professional football game." Milan: Zlatan Ibrahimovic says that he is open to the possibility of working with Pep Guardiola once more despite the clashes between the two which resulted in the Swede leaving Barcelona in 2010. The AC Milan striker, speaking exclusively to Goal.com, explained that he would be happy to work with the man who he voted for as the best coach in the world, but would want the Spaniard to explain what brought about his decision to freeze him out of the Barcelona set-up before his cut-price move to Milanello. "As it is now, no, [I wouldn't work with Guardiola], because I don't have answers about what happened," Ibrahimovic explained. "But what I think about him is nothing personal and it doesn't mean that I think he's a bad coach, because when I got to vote I said he was the best coach in the world. "The person and the coach are two different things, and as a coach he is fantastic or else he wouldn’t win all the trophies he wins and make a team like Barcelona. But my thing with him was as a person, so you should never say no because people say no today and maybe yes in the future. The question is: would he work with me?" Ibrahimovic came up against one of the people whom he thanks for his support during his difficult spell in Catalunya on Wednesday night, with former team-mate Thierry Henry having been among the Arsenal side that Milan beat 4-0 in the Champions last-16 first-leg clash at San Siro. And, having become very good friends during their year together at Camp Nou, the Sweden international is also quick to highlight the achievements that the Frenchman has accomplished as a footballer. "I know Thierry Henry and what he did for football – and he made history in football – and as a person I think he’s even better because he's a fantastic person, and he has a big heart. 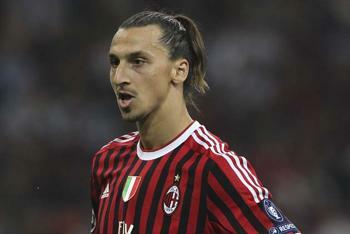 He’s a big friend of mine, and we spent a lot of time together [in Barcelona]," Ibrahimovic said. "It was a good moment for me [on Wednesday] because I hadn't seen him in a long time and he was there also when I had a little bit of a struggle at the end in Barcelona and he was always trying to be positive with me. We had a good joke too, so it was nice seeing him." Henry has now returned to his partner club New York Red Bulls in Major League Soccer, meaning that he will miss the second leg of the tie at the Emirates stadium. But, with both Milan and Barcelona on the verge of the quarter-finals, another clash with Guardiola could well be on the horizon for the irrepressible Swede. Juventus: Juventus eased to a 3-1 win at home to 10-man Catania to regain first place in the Serie A standings, despite having gone behind early on at Juventus Stadium. Pablo Barrientos shocked the Bianconeri with an early strike, but shortly after Andrea Pirlo drew the game level with a fine free-kick from just outside the box. The former AC Milan man stepped up his game even further in the second period as he provided assists for Giorgio Chiellini and Fabio Quagliarella after the visitors had had Marco Motta sent off. Catania made a brilliant start to the match as in the fourth minute Motta, on loan at the Sicilians from Juventus, picked out Barrientos outside the box, and the Argentine took a few steps before firing a precise shot into the lower left corner. The Old Lady quickly recovered from the early setback, and began mounting increasingly dangerous attacks. The deserved equaliser came in the 22nd minute through Pirlo. The midfielder struck from a free-kick from outside the box, sending a beautiful effort in the lower right corner for his first goal for Juventus. The Bianconeri continued to press as they aimed to take advantage of their momentum, and they nearly went in front on the half-hour mark when Quagliarella sent a shot crashing onto the bar. Moments later, however, Catania responded through Francesco Lodi, the midfielder forcing a superb reflex save from Gianluigi Buffon, who managed to parry the ball against the woodwork to save his team from conceding a certain goal. Little changed after the break as the Old Lady continued to press forward in search of the winner. Pirlo and Quagliarella went close on a couple of occasions, but it seemed increasingly likely that the game would end in a draw. In the 65th minute Motta severely damaged Catania's chances of earning a point, as he was deservedly shown a second yellow card for a ghastly challenge on Juventus left-back Paolo De Ceglie. It looked like a matter of time before the Old Lady would take the lead, and indeed they did 10 minutes later. Chiellini was in the right place at the right time to head in yet another brilliant free-kick from Pirlo, continuing an impressive show by the midfielder. Catania looked unable to contain the former Milan man, and he was not done for the night yet. In the 81st minute, he slid a superb through ball in for Quagliarella, who raced ahead of the Sicilian defence and fired a low shot, which deflected off Tomas Kosicky before looping into the net to put the game well beyond any doubt. Following tonight's result, Juventus are first in the standings with 49 points, two more than title rivals Milan, who they face in the next round of Serie A. Catania sit in 14th place with 27 points after 22 games. Madrid: Real Madrid earned another comfortable La Liga victory as they defeated 10-man Racing Santander 4-0 at the Santiago Bernabeu on Saturday to move one step closer to the league title. Los Blancos were ahead in the sixth minute through Cristiano Ronaldo's header before Racing went down to 10 men after the referee awarded Domingo Cisma a second yellow card. Madrid were 2-0 up at the break when Benzema netted in injury time. Angel Di Maria marked his return from injury with a superb strike in the 73rd minute, before Benzema added his second and Madrid's fourth in the 89th minute to put the icing on the cake for the home side ahead of Tuesday's clash at CSKA Moscow in the Champions League. The win gives Jose Mourinho's men a 13-point cushion at the top of La Liga with rivals Barcelona not in action until Sunday evening, when they face a tricky test against third-placed Valencia. Madrid made a lively start to proceedings and could have found themselves a goal to the good in the fifth minute. Kaka's inviting corner was met by a downwards header from Ronaldo who could only watch on in despair as the ball struck the post before the visitors cleared the danger. However, Mourinho's side only had to wait another minute before finding the back of the net. Benzema's through ball fell to the feet of Kaka, who saw his shot parried by Tono. The quick-thinking Brazilian then headed the rebound across the Racing goalmouth for Ronaldo to nod home for his 35th goal of the season in 34 appearances in all competitions. The visitors' fortunes turned from bad to worse on 39 minutes when they were reduced to 10 men after Domingo Cisma was shown a second yellow card. The full-back was adjudged by the referee to have intentionally blocked Ronaldo's cross with his hand, but replays showed the former Almeria man was harshly given his marching orders. Madrid doubled their lead with the last action of the first half when Benzema netted in added time. Xabi Alonso was alert to slide a set piece through to the Frenchman, who clipped an effort over the head of an onrushing Tono with Sergio Ramos on the line to make sure the ball ended up in the back of the net. The home team looked comfortable throughout the second period and added a third in the 73rd minute. Substitute Angel Di Maria, making his first appearance for Los Blancos in 12 games, cut infield from the right wing before smashing the ball past Tono and into the far corner of the net from the edge of the box. Benzema added his second of the game in the 89th minute after the striker picked up a rebound from Di Maria's parried effort. The former Lyon striker smashed the ball high into the goal via a deflection from Bernardo as Madrid easily secured all three points. Madrid now head to Russia, where they will face CSKA in the first leg of their last-16 Champions League encounter, while Racing are next in action in La Liga versus Sporting Gijon on February 25. London: Arsenal suffered an ignominious exit from the fifth round of the FA Cup as they slumped to a 2-0 defeat at the hands of Sunderland on Saturday. The Gunners lost Francis Coquelin to injury within 10 minutes before Kieran Richardson put an end to a frustrating half with a left-footed shot that deflected off the Frenchman's replacement, Sebastien Squillaci, into the net. Alex Oxlade-Chamberlain was then unfortunate late in the second half to divert Craig Gardner's cutback into his own net and confirm his side's exit. Sunderland made only one change, Sebastian Larsson coming in for Fraizer Campbell on the right of midfield, while Arsene Wenger made five changes from Arsenal’s 4-0 mid-week mauling at AC Milan. Theo Walcott was dropped with Gervinho and Oxlade-Chamberlain occupying the flanks, while Lukas Fabianski, Johan Djourou and Coquelin were all also introduced. The Gunners made a confident start, dominating the opening minutes and seeing Mikel Arteta’s free kick only slightly wide, but suffered more injury woes just a moment later when Coquelin was forced off inside nine minutes due to a hamstring problem. The home side needed until the 14th minute to even approach the Arsenal goal, Stephane Sessegnon picking up the ball from a quick free kick and attempting an effort from some way out, but it flew comfortably enough past Fabianski’s post. Sunderland grew into the game but the first real save came towards the half-hour mark when Gervinho was supplied the ball by Robin van Persie deep in the Sunderland half on the counter. Running slightly away from goal to try to escape the attentions of the covering defender, the Ivorian aimed a shot towards the top corner but Simon Mignolet parried it solidly away. Arsenal fans could potentially feel aggrieved after a strong penalty claim was turned down by referee Howard Webb. Van Persie was sent clean through on goal but John O'Shea was adjudged to have won the ball in his sweeping challenge which left the striker on the ground. The Gunners were controlling the game for several minutes when, towards the end of the half, Djourou gave away a foul near Sunderland’s right wing. Larsson stepped up to whip in an in-swinging delivery that was headed away in the area, but Richardson was on hand to pick up the rebound and aimed a riposte across the face of the goal, deflecting into the far corner off substitute Squillaci with his left foot. Buoyed, the hosts nearly instantly doubled their lead, breaking with verve. Larsson advanced down the right and launched a long pass towards the far post where Jack Colback kept it in and teed up James McClean, who fired into the side netting with Fabianski closing in. Having controlled the game in spells, Arsenal found themselves needing to dig themselves out of a hole as half-time arrived. The Gunners were delivered another warning just after half-time when Sunderland got a free kick just past the left edge of the area, which Larsson dipped menacingly just over the bar. As Wenger looked to effect changes, Aaron Ramsey succumbed to his earlier knock within a few minutes of the restart and made way for Tomas Rosicky, while Squillaci, too, had to be substituted himself with an injury as Arsenal introduced Walcott in their final throw of the dice. The Gunners were lucky not to lose another man when Djourou slid into an awkward tackle just in front of his box with both feet. Already on a yellow, the Swiss’ challenge went ignored by Webb. With more than one foul starting to creep into the game, Larsson gave away a set-piece in a promising position for Arsenal, but Van Persie’s resulting shot was deflected wide by one of many bodies in the area. As Sunderland fans started taunting Wenger and Arsenal, the game became quiet with no clear-cut chances and few moments of skill, the Gunners manager visibly unimpressed by his side's display. 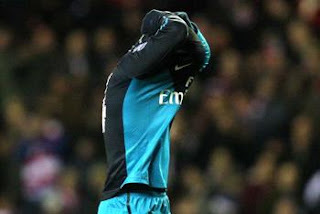 Arsenal finally brought a moment of threat on 75 minutes when a free kick found Thomas Vermaelen forward in the area. The Belgian centre-back met it with a header but his effort lacked venom and was caught by Simon Mignolet. The visitors pushed forward once more but Sunderland hit them on the counter, Sessegnon breezing past a slipping Arteta and advancing menacingly. The Benin international passed right to Larsson in the area, who was crowded out but still connected with the post. In reaching the goal-line to help defend, however, Oxlade-Chamberlain could not prevent the ball rebounding at his feet before bobbling over the line to deepen Arsenal's malaise. Van Persie had a half-chance as the away side looked to revive themselves but he could only muster an effort over the bar from an unbalanced position, whilst Sunderland responded a moment later with a threatening counter, McClean hovering dangerously before Bacary Sagna cleared. Sunderland defended resolutely in stoppage time to prevent any glimpse of genuine opportunity for Arsenal before the final whistle confirmed their progression. Arsenal are already out of contention for the Premier League and are struggling to maintain a place in the top four of the English championship, so their exit from football's oldest knock-out competition means they are just about certain to go without a trophy of any kind for a seventh straight season. Having lost the first leg of their Champions League knockout match 4-0 at AC Milan this week, Arsenal are out of contention for all honours unless they can summon a most unlikely European comeback. Barcelona: Pep Guardiola still hasn't decided whether he wants to continue coaching Barcelona beyond this season. The 41-year-old Guardiola, who has won 13 out of a possible 16 titles since taking over the European champions nearly four seasons ago, said he would like to have made a decision already but he remains uncertain. "I would have liked to have made my decision earlier but it still isn't clear to me," Guardiola said on Saturday. "It's a personal question. I need to find the motivation to continue and it still isn't clear." Guardiola had signed consecutive one-year extensions after initially agreeing to a two-year deal to start the 2008-09 season. Barcelona have reached the Copa del Rey final and are poised to reach the Champions League quarter-finals, but the three-time defending Spanish champions trail league leaders Real Madrid by 10 points. Guardiola's position has become a distraction for Barcelona since he had agreed to extensions by this stage of the season in the past two years. Guardiola said the Catalan club had not issued any ultimatums to him about making the decision. "Right now I prefer to take a little more time. I don't want to say yet, I need to feel certain," the former Barcelona player said. "If people respect that, great, if not, too bad. This is the situation there is, I've already answered many questions about it and I have nothing else to say." Barcelona go into Sunday's match against Valencia on the heels of only their second loss of the season, at Osasuna. They won 3-1 at Bayer Leverkusen in the Champions League on Tuesday but this season has been more complicated for Guardiola, with midfielders Xavi Hernandez and Andres Iniesta having been sidelined by injury. Guardiola benched defender Gerard Pique on Wednesday in Germany. Since Guardiola's arrival, Barcelona have won three straight Spanish leagues, two Champions Leagues, two Club World Cups, two European Super Cups, three Spanish Supercups and a Copa del Rey.